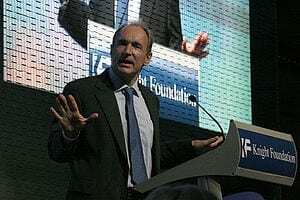 Web creator Sir Tim Berners-Lee has warned that the democratic nature of the net is threatened by a “growing tide of surveillance and censorship”. The warning came as he launched his World Wide Web Foundation‘s annual web index report, tracking global censorship. It suggests that 94% of the countries in the index do not adequately monitor government internet interception. Thirty per cent of countries block or filter political content, it indicates. The report concludes that the current legal framework on government snooping needs urgent review. “One of the most encouraging findings of this year’s web index is how the web and social media are increasingly spurring people to organise, take action and try to expose wrongdoing in every region of the world,” said Sir Tim. “But some governments are threatened by this, and a growing tide of surveillance and censorship now threatens the future of democracy. Bold steps are needed now to protect our fundamental rights to privacy and freedom of opinion and association online,” he added. Sir Tim has been an outspoken critic of government surveillance following the revelations from whistle-blower Edward Snowden. He described attempts by the spy agencies to crack encryption as “appalling and foolish”. He has previously said that the checks and balances to oversee GCHQ and its US counterpart, the National Security Agency (NSA), have failed. It is a view shared by digital forensic expert Professor Peter Sommer. April 12, 2019 - Meet 'Surveillance Capitalism,' Our Terrifying New Economic Order The FederalistShoshana Zuboff's new book, 'The Age of Surveillance Capitalism,' warns that Silicon Valley is amassing your data to subvert your rights and even thoughts. March 26, 2019 - Smart talking: are our devices threatening our privacy? | Technology The GuardianMillions of us now have virtual assistants, in our homes and our pockets. Even children's toys are getting smart. But when we talk to them, who is listening? April 18, 2019 - Police Release Surveillance Video from Illinois Workplace Shooting That Killed Five Yahoo NewsPolice released surveillance video of a shooting that left five people dead and six others wounded in February at an Aurora industrial complex. April 3, 2019 - American Dystopia: The State, Surveillance, and Illusion of Choice The InterceptThe Intercept's Alice Speri, author Cory Doctorow, and musician Katie Alice Greer are this week's guests. April 8, 2019 - Assange faces ongoing threats at Ecuador's London embassy World Socialist Web SiteOver the weekend, the Ecuadorian government issued a statement denying that it was going to “imminently” expel Julian Assange from its London embassy.